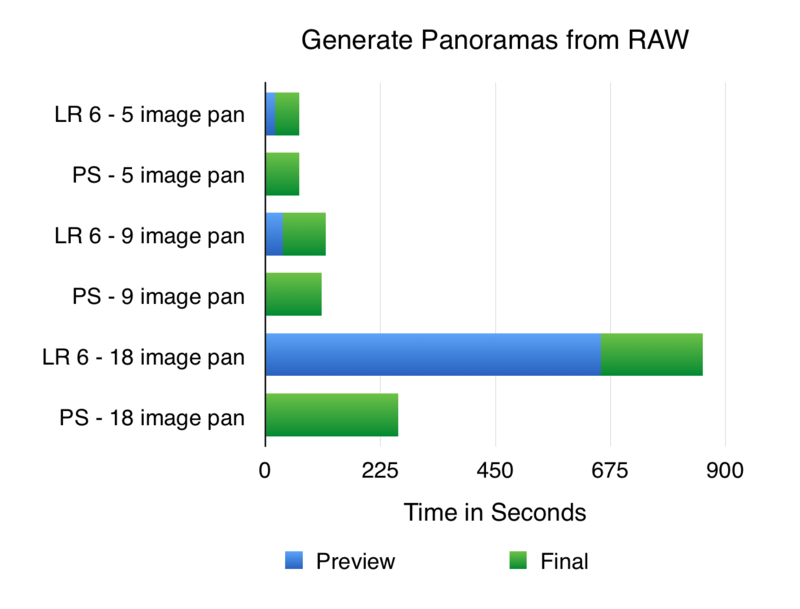 With the release of Lightroom 6 / CC, there has been a lot of hype about the performance speedups in image rendering. Being curious, I ran a few tests to see how much LR6/CC may have improved for my own workflow. 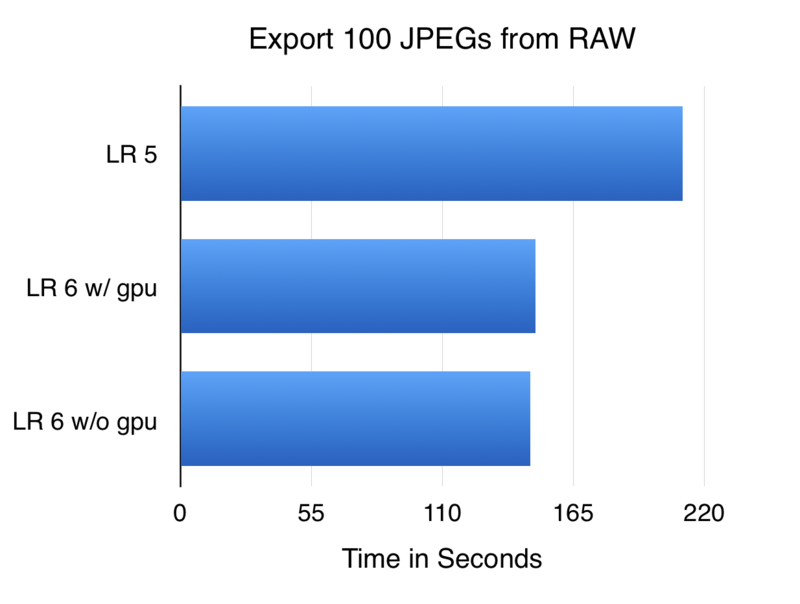 Processing and exporting from raw files is significantly faster in LR 6/CC (about 30%). The GPU did not make a difference. 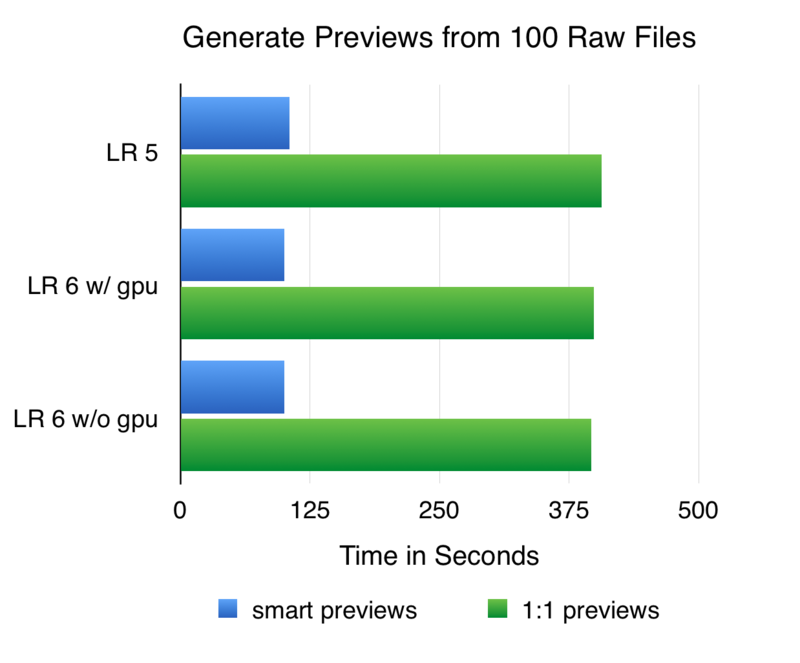 No difference in generating previews between LR 5 and 6. Small panoramas take roughly equivalent time in PS and Lightroom. But my test with a large panorama (18 images) was over 3x slower in LR than PS. HDR takes about the same time in LR or PS (slight edge to PS). Note that the HDR and Panorama algorithms in LR 6 are not exactly equivalent to their PS counterparts. 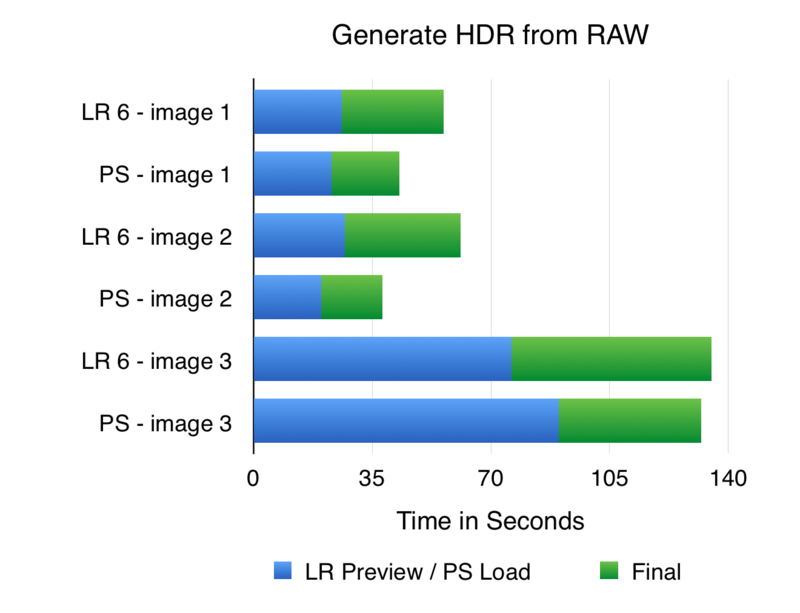 For example, LR generates a 16 bit HDR file whereas PS is 32 bit. I ran tests on my late 2013 retina Macbook Pro with 16GB RAM, Nvidia Geforce GT 750M gpu, and the Lightroom catalog on the internal SSD. The image files were on an external 3 disk thunderbolt RAID-0 stripe. The images for testing were my own edited RAW files with the majority being 21MP captures from a Canon 5d Mark II. Timing done manually (so don’t expect times to be more accurate than +/- 1 second). The above graph is based on 3 test HDR images. The first two involve a 3 image set taken with 2 stop brackets. The third image involves 8 bracketed images at 1 stop. Note that both LR and PS create HDR images in 2 steps: in the first the images are loaded and a preview (LR only) is generated. In the second, a full size HDR is generated. Note that LR generates a panorama in two steps: (1) preview generation, and (2) full size rendering. In contrast, PS generates the final panorama in one step. LR and PS took comparable times for the two smaller panoramas (5 and 9 images), however the third panorama (with 18 images) was much slower in LR. Also, preview generation took the majority of time making that step less useful (one might as well generate the final image). Ideally for larger panoramas we would like the preview to be quick so that we can decide whether it is worth the time to fully process the composite image. 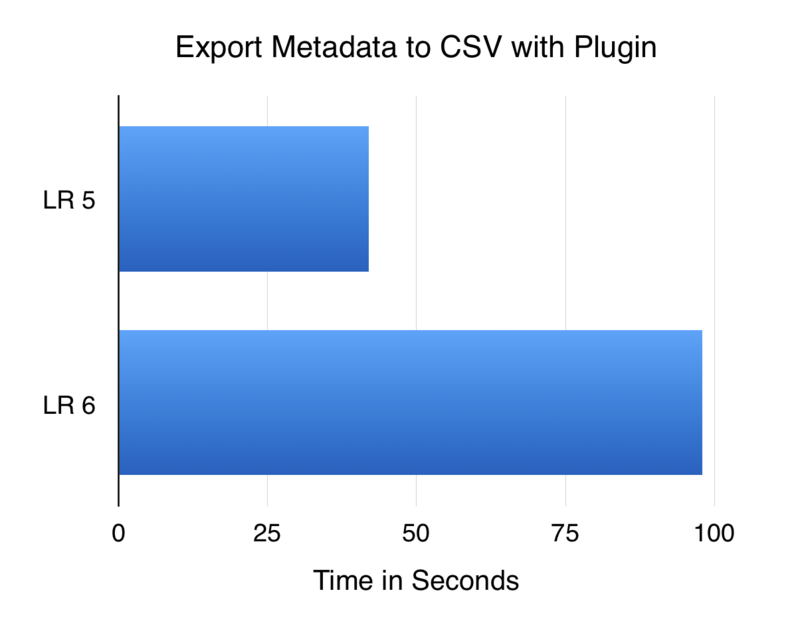 The above graph is based on exporting metadata such as keywords, captions, dimensions, etc from the image files into a CSV file. For this, I used Jeffry Friedl’s Metadata Wrangler plugin. The times in the graph are based on processing 7326 images (everything I have on my website). Lightroom 6 is substantially slower than 5 so there may be some changes behind the Lightroom SDK for plugin developers. 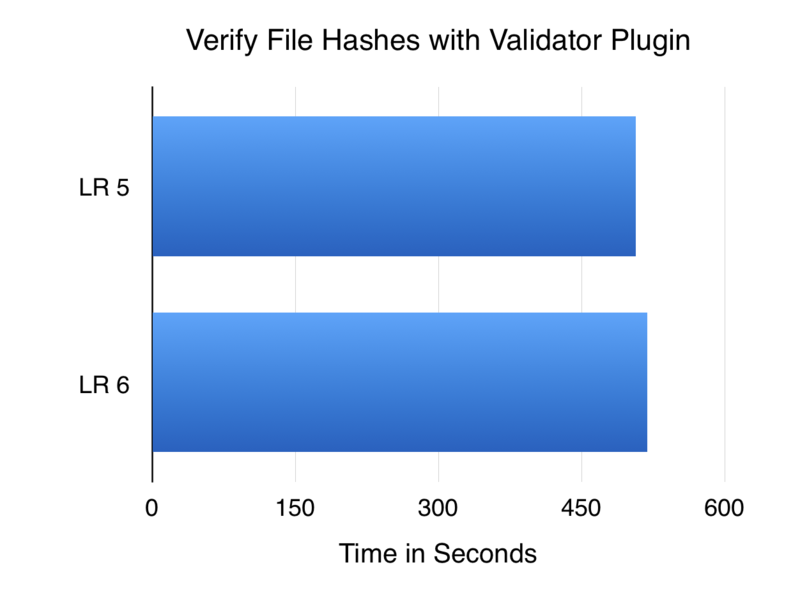 The above graph is based on my Validator plugin for verifying RAW files based on hashes. This test involves computing MD5 hashes via the Lightroom SDK on 7326 images and comparing to previously stored values. No difference in timing here. Validator is a Lightroom plugin to verify image files and check for file corruption or "bit rot".